The world's gourmet greats say Bresse Chickens rule. We had to try. Here we are in our little Renault Clio traveling the back roads of France when giant chickens advertising the famous poulet de Bresse start showing up on gigantic posters. Yes, even Peter Malle has searched out these tasty morsels clucking contentedly in the countryside; we would follow in his rather large footsteps. But where to find the quintessential Bresse chicken in a restaurant when you've done no research? Ah, there's the rub. 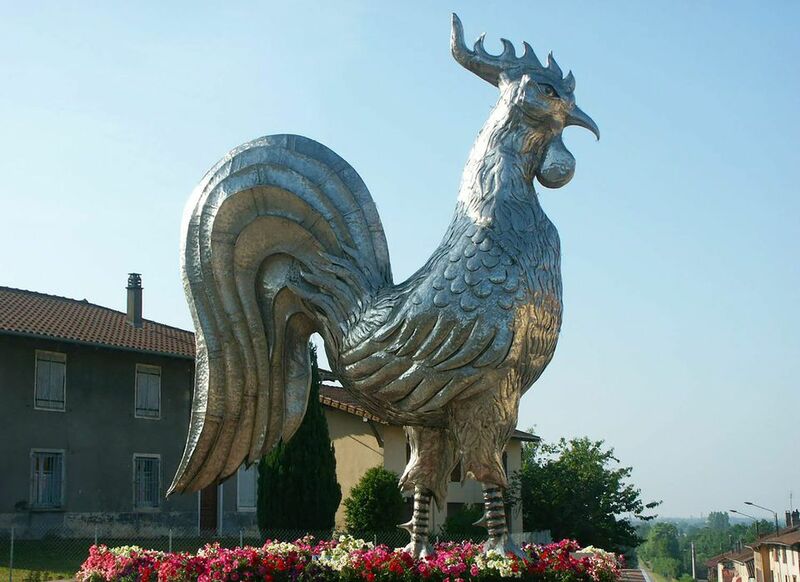 We were heading south toward the big town of Bourg-en-Bresse in the N479 but then, as if a sign from a higher power, we saw what we were searching for: a huge chicken painted on a sign in front of a restaurant called La Maison du Poulet de Bresse. Perfect. Then we noticed a tour bus parked alongside. You can't have everything. That evening we walked to La Maison du Poulet de Bresse. We were the only people in the restaurant. The meal, however, was superb. I had my Bresse chicken in a sauce of cream and morels, and Martha had her chicken in a red wine sauce with an egg on top. I don't know which was first. Sandra and Raphael Duclos run La Maison du Poulet de Bresse, and they've done a superb job in my opinion. Yes, they tasted different than the scrawny chickens you get in a plastic sack in Safeway. They should, since our research found that a Bresse chicken in a French supermarket was marked 17 Euros. Steep. But, if you like flavor in a chicken, it's worth it. Bresse chickens are treated like fine wine. They have an appellation, a particular place where they come from, and they are a particular breed. Plus, they get to eat real food and walk around the countryside, all regulated by law. Romenay is located in Southern Burgundy, in the Saône et Loire region of France, northeast of the town of Macon. Paris is 392 kilometers to the north, and Lyon 74 km to the south. The region makes a nice, lightly-touristed place to visit, and offers 20 chateaux open to the public, sixty museums, and several historic and prehistoric sites. Nearby towns along the Saône and the Seille rivers are quite picturesque, and barge travel is popular in the region. The village of Cuisery to the northeast of Romenay is called the "Village of Books" because many of the stores in the medieval town deal in books--from first editions, to collectibles. Oddly enough, Cuisery wasn't always so bookishly inclined, it only became a village du livre in 1999 but now has 10 booksellers and 4 book artisans (old printing presses, engravers and calligraphers, genealogists and local history exhibition). For an interesting report on book towns, from which the numbers above were drawn, see Paul McShane's paper on book towns throughout the world for the Winston Churchill Memorial Trust of Australia. The town also has a gourmet restaurant and hotel on the main drag called the Hostellerie Bressane serving fine local cuisine and offering well-appointed rooms for a reasonable cost. There's also an interesting church, the Notre Dame de Cuisery that dates from the 16th century.